Domino's new Bolognese Garlic Baguette down in Australia is basically like spaghetti and garlic bread all-in-one, but without the noodles. 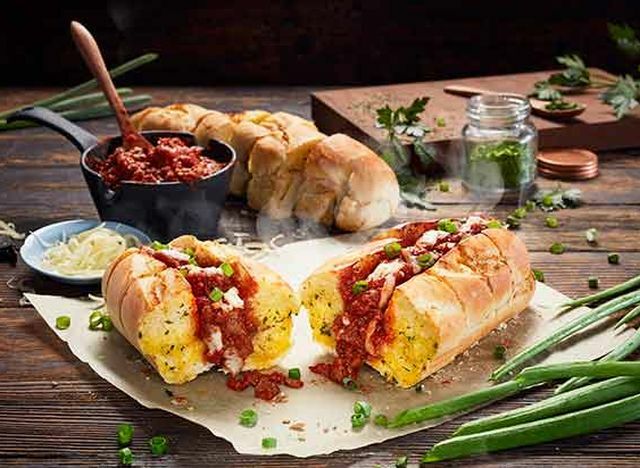 The dish features an order of garlic bread cut open like a hot dog bun, stuffed with ground beef and Bolognese sauce and topped with mozzarella and green onions. It's also being offered in nearby New Zealand. The new side can be found in the country at $5.95 AUS (~$4.58 US) per order. While the Bolognese Garlic Baguette is only available for a limited time, Domino's regularly offers both garlic bread and cheesy garlic bread in Australia (between you and me, I'd happy if just one of the major chains offered plain garlic bread instead of breadsticks here in the US).